Many Older US residents who came in 70's and successful,can afford to travel business class and do.They seem to prefer the Europeans as they are Familiar with London Frankfurt and Amsterdam airports and since they are citizens visa is not an issue. Whether this particular group will switch to ME3 for better price is the unanswered question. JET in earlier days got praise but I wonder now. 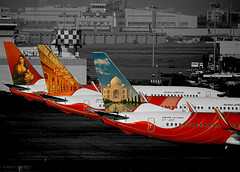 AirIndia is a different question.Dont like AI staff and Desi Goverment officials throwing their weight around and sometimes behaving poorly.